BIHE 2015, the 21st Azerbaijan international healthcare exhibition will take place from 18–20 September 2015. For 21 years, the exhibition has served as a platform for establishing business contacts and sharing experience between professionals from medical institutions, suppliers of modern medical equipment, pharmacists, and academics enabling them to improve the efficiency of healthcare systems in Azerbaijan. BIHE takes place with support from the Ministry of Health of the Republic of Azerbaijan, the Azerbaijan Stomatological Association, the Azerbaijan Export and Investment Promotion Foundation (AZPROMO), and the National Confederation of Entrepreneurs (Employers) Organisations of the Azerbaijan Republic (ASK). 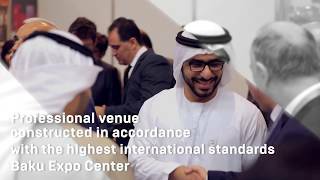 BIHE is an UFI approved event, attesting to its quality and recognition from the global events community. The organisers are Iteca Caspian and ITE Group. This year, the exhibition will present 189 companies from 19 countries such as the UK, Iran, China, Latvia, Finland, Germany, USA, Switzerland and many others. The Czech Republic will present a national stand of 10 leading Czech medical companies. Russia will present 27 companies with support from the Ministry of Industry and Trade of the Russian Federation. Turkey will also present a national stand for the first time for companies specialising in medical tourism, and Iranian pharmaceutical companies will also be very active at the exhibition. Foreign companies will make up around 60% of all exhibitors at BIHE. Local exhibitors will include major distributors of medical equipment from well-known global manufacturers. Among distributors will be ARASH Medical, Besan, Vitta, Labservis and others. The number of exhibitors has increased by 12% since last year. Exhibits at BIHE 2015 covered all the main aspects of medicine: medical and laboratory equipment, supplies, pharmaceutical products, medical instruments and paediatric nutrition. This year, the exhibition will present new products in various areas of medicine including instruments for accurate and informative blood analysis, the latest devices for diagnosing diseases in foetuses, surgical chairs with various options to change the position of the patient, numerous new medicines and much more. The Medical Tourism sector of the exhibition has been developing since its introduction. This year, the sector will present services from 30 clinics and companies from Georgia, Latvia and Turkey involved in organising treatment abroad. Alongside foreign clinics and sanatoriums, the sector will present tourism companies involved in sending patients abroad for treatment. This year, the sector is supported by the Association of Turkish Travel Agencies (TURSAB). This year, the exhibition will be characterised by its broad business programme. On 18 September “The Russia-Azerbaijan: Pharmaceutical and Medical Industry Today and Tomorrow” forum will take place. Among delegates will be manufacturers of medical equipment and supplies, pharmaceutical companies interested in government bodies in Russia and local healthcare companies. On 19 September, the 9th scientific and practical conference “Modern Methods of Diagnostics and Treatment in Midwifery, Gynaecology and Neonatology” will take place. At the conference, which is supported by the Ministry of Health of the Republic of Azerbaijan and the Public Association of Support for Gynaecology and Perinatology, specialists will share their best practices. On the same day, “The 10th scientific and practical conference Current Issues in Cardiology” will also take place with both local and international specialists. TURSAB will also organise another conference on medical tourism on 19 September. Stomatology Azerbaijan 2015, the 10th Azerbaijan Dental Exhibition, and Beauty Azerbaijan, the 9th Azerbaijan Beauty Exhibition will run in parallel with BIHE. Exhibitors of Stomatology Azerbaijan 2015 will present new dental equipment and supplies. Beauty Azerbaijan 2015 will present 15 companies from Azerbaijan, Bahrain, Germany, Canada, China, Turkey and other countries. Visitors will learn about industry innovations and interesting offers for professionals and salons. Innovations will be presented by not only foreign manufacturers, but also local distributors such as BTL, ZNK, Vitta Estetik who will use the exhibition to introduce new cosmetics and perfume lines to Azerbaijan. Beauty Azerbaijan 2015 will offer professional cosmetics, skin, body, and haircare treatment, a wide range of equipment for beauty salons, cosmetics apparatus and much more. In recent years, the exhibition has seen a growth in interest from perfume manufacturers. As numerous hotels and salons offering spa services have opened in Azerbaijan, the exhibition has increased the amount of offers in this area. Manufacturers and distributors will offer original solutions to help beauty salons, fitness clubs, spa centres and hairdressers create exclusive offers and stand out among competitors. Over three days, the exhibitions will become the place for partners and doctors to meet, build new channels of cooperation, assess the market, and make agreements on contracts and investments. During the exhibitions, specialists from across Azerbaijan will get the opportunity to learn about products and innovations from foreign and local companies. Knowledge gained at the exhibitions will contribute to improving the quality of medical services and develop aesthetic medicine in Azerbaijan. The official partners of all exhibitions in 2015 are SafeLife (the security partner), Greenwich Travel Club (tour operator), and official hotels Jumeirah Bilgah Beach Hotel Baku and Qafqaz Point Hotel. Follow our social media channels for the latest news from the exhibitions. A free minibus shuttle service will be provided between Koroglu metro station and Baku Expo Center.